From the construction of the Fitton Center for Creative Arts, to aggressively marketing Pyramid Hill, to proclaiming itself The City of Sculpture, Hamilton has been actively reinventing itself as an arts-friendly and arts-centered community since the early 1990s. One of the most recent efforts, however, has been the development of the Artspace Hamilton Lofts, a partnership between Neighborhood Housing Services of Hamilton and Minneapolis-based Artspace Projects. When finished next summer, the $11.8 million mixed-use development will include 42 market-rate rental units including studios, one-, two-, and three-bedroom options. It will also include commercial and studio space on the first floor for burgeoning local artists. Since its inception in the late 1970s, Artspace has transformed itself from simply being an advocate for the needs of artists into one of the premier non-profit developers of art-centric residential and commercial space in the United States. From artist cooperatives, to family lots, to non-residential projects, the Artspace Hamilton Lofts will continue their mission of creating unique, historic spaces for artists and arts organizations. The Artspace project is also indicative of Hamilton’s efforts to reinvigorate its downtown by embracing its architectural past. Beginning in the 1960s and 70s, in an effort to appear more modern and match the neighboring structures that were being constructed, many of Hamilton’s downtown buildings had superficial metal facades installed on them that masked the original architectural details. 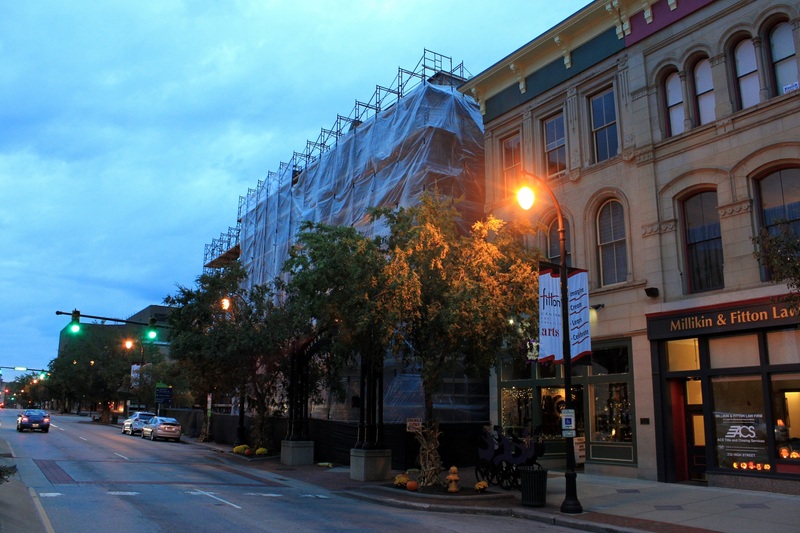 Fortunately, two of these surviving buildings, the Mehrum Building and Lindley Block, are in the process of having those metal facades removed as part of the Artspace project. The two properties were selected for the project after an extensive search, for the best location in Hamilton, over the past several years. According to the Hamilton Lofts project lead, Sarah White, these facades have, in an ironic twist, protected the buildings from the elements over the years. While the structurally important aspects of the two century-old buildings will be left intact, the soft interiors are being completely gutted and rebuilt so that they will function as one. The project was funded through a combination of public and private sources, including state historic tax credits and the National Endowment for the Arts and the Hamilton Community Foundation. Project officials say that leasing will begin in the spring, and that those who are interested in applying for one of the residential or commercial art spaces can do so by attending their next informational session on Tuesday, November 18 at the Oxford Community Arts Center. EDITORIAL NOTE: As part of our efforts to continue to keep you connected with what is happening in the urban areas of our region, we have added a new writer dedicated to covering Butler County’s historic urban cities of Hamilton and Middletown. David A. Emery, a graduate of the University of Cincinnati’s School of Planning and former Hamilton resident, will be covering these cities in an effort to provide coverage of two other urban centers in our metropolitan region that boast significant populations and were 19th century boomtowns along the Great Miami River and Miami-Erie Canal. Over many generations, both cities have been pulled into Cincinnati’s cultural and economic influence, and now essentially serve as satellite cities to the Queen City. The both, however, also are interesting places that are dealing with issues of urban redevelopment, diverse populations and changing economies. Previous articleWhat can cities do to roll out BRT faster?